The arbitrator overseeing the case brought by Colin Kaepernick accusing the NFL of colluding to keep him off the field has ruled that the case can proceed. 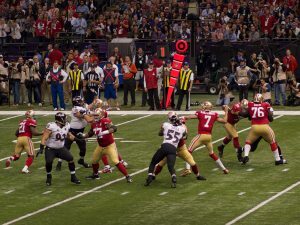 Arbitrator Stephen B. Burbank, who was appointed by the league and the NFL Players Association, found that lawyers for Kaepernick had provided enough information in support for the case to continue to a full hearing. The decision was posted on social media by Mark Geragos, Kaepernick’s lawyer. Kaepernick, once one of the league’s best quarterbacks, began to protest during the playing of the national anthem in August 2016 by kneeling during the song. The protest was meant to bring attention to racism, police brutality against minorities, and social injustice. Other players soon joined in. Some fans were angered by what they saw as disrespect for the national anthem and began to vocally criticize the league for allowing the protests. The issue has been a hot one ever since. More attention was brought to the matter by persistent tweets from President Donald Trump, who has called for players who protest during the anthem to be punished or fired. The league changed its anthem policy in May to require players to stand if they are on the sideline during the national anthem, while also allowing them to stay off the field if they want. However, the NFL has put a hold on enforcement of the policy while league executives and the players’ union discussed whether or how to proceed. Kaepernick has not been signed to a team since March 2017, when he became a free agent before the San Francisco 49ers could release him. Despite playing six years with the 49ers and leading them to the Super Bowl in his second season, no team has been willing to pick him up. He filed a grievance against the NFL in October alleging that the league’s owners had conspired to keep him out because of his protests. Kaepernick is seeking damages equal to what he would have earned if he were still playing in the league. The arbitrator’s decision is a major blow to the NFL, which had asked for the case to be dismissed for lack of evidence. The ruling, essentially granting a full hearing on the dispute, keeps the case alive. Now, the lawyers will be able to question league officials, team owners, and others in a trial-like format. The organization cannot appeal the arbitrator’s decision to move to a full hearing, but it can appeal a final ruling. A hearing could begin by the end of the year.